Regularly changing Windows password is a good way to protect it well, however, this will also bring up a problem, that is, you may easily forget the password you created. Especially when you created a strong password. Is it possible to bypass Windows password when is forgotten? Of course, you can bypass Windows 10/8.1/8/7 Password with two methods below. The easiest way to bypass a forgotten Windows password is to use a previously created password-reset disk. A password reset disk is a file you create on a USB drive or an SD card that when plugged into your Windows PC will allow you to reset your password right on the lock screen. However, if you don’t have a password-reset disk and you need to reset your Windows password, I suggest you refer to method 2 to use a Windows Password Recovery Software which can help you creat a new reset disk. To get started, plug your password-reset disk into your locked computer. Step 1. Click “Reset Password”, then you can see a Password Reset Wizard window. Step 2. Follow the steps in the Password Reset Wizard to create a new password. Step 3. Now you can login into your computer with new password. 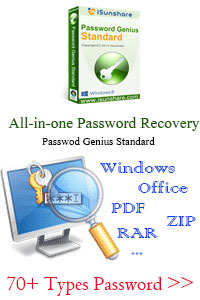 If you can’t remember the password and also have no disk, what can help you should be an effective Windows Password Recovery Software, I haved tested a few password recovery for Windows and select 3 of them as the top best Windows password recovery tool, recommend you can use the NO.1 of the list, Windows Password Recovery, to help you bypass Windows 10/8.1/8/7 password. This tool is very effective at resetting forgotten or lost Windows password, including admin password, normal account password for Windows 10 /8/7, Vista/XP and Windows Server 2000/2003/2008/2013 at very quickly and appropriately manner. Step 1. Download and install Windows Password Recovery on an accessible computer. Click the button below to download this program on a computer you can get access into. After installation, launch the software, you can see the main interface as follow. Prepare a CD/DVD or USB flash drive and insert it into your accessible computer. You can choose meida type from “CD/DVD” or “USB device” on the software. In here, I will take USB drive for example. Select the USB device and click Begin burning button to start writing image files to the USB drive. When the burning is succeeded, exit USB flash drive. Insert the USB reset disk to your computer which is locked by password. Boot your computer and enter into BIOS settings by typing certain keyboard. Then choose the option of booting from USB. Now Windows Password Recovery will run on the locked computer and reloads all Windows user accounts, select one of the accounts on the list, and click Reset Password button, it will pop up a windows to comfirm to remove Windows password, then click Reboot button to restart your computer, on Windows logon screen, just click the administrator and you could login Windows computer successfully without admin password. Now you have successfully bypassed login password for Windows 10/8.1/8/7. Forgot Laptop Password, How to Reset?